Trees are incredibly vital as they not only add aesthetic appeal to your home but also provide shade and most importantly — improve air quality. 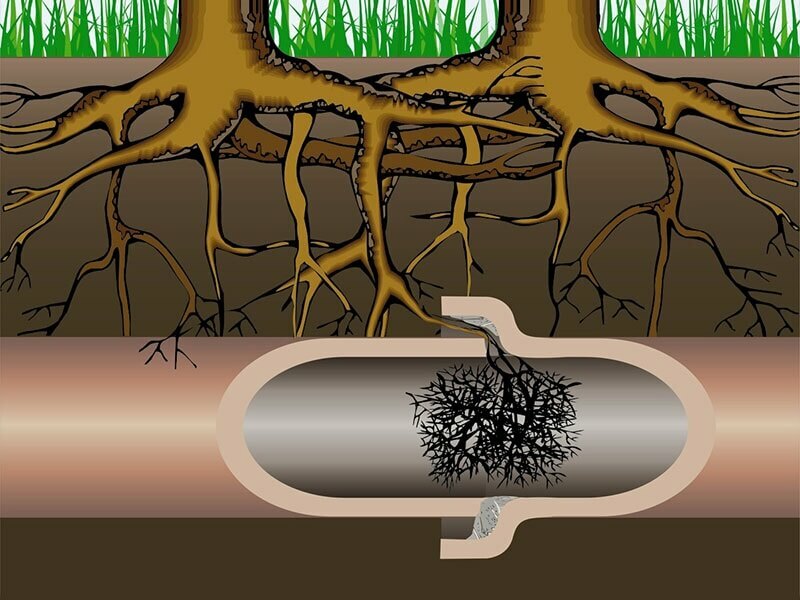 On the flip side, tree roots often grow towards sewer lines and can tear right through the pipes, because the sewer pipes carry plenty of water, oxygen, and nutrients that roots crave. Roots find a way to the inside of sewer pipes mainly through cracks or leaks. And when this happens, the roots will quickly grow into the pipes and eventually cause blockages. Blockages will also lead to broken pipes due to too much pressure. This can cause any homeowner a serious headache, as repairing the damage can cost thousands of dollars. The good news is that homeowners can easily avoid costly repairs. Well, here is how to go about it. Locating your sewer line is essential to determine if the trees are planted close to it. And this is an incredibly easy task to do. As a standard requirement in homes, there should be sewer cleanout caps in two places. Just check for the Black ABS or white PVC pipes, which are typically sticking out of the ground near the house, a few feet from your foundation wall. Another cleanout cap should be located several feet from the curb (within 13 feet to be precise). You can use this to know exactly where the sewer lines lie because generally the pipes run underground connecting the two places. But what if you can’t find the sewer cleanout caps? Well, you don’t need to take any chances. The best course of action is to call your Water and Sewer Department in Knoxville, Tennessee. They’ll send a professional locator who can easily locate your underground pipe for free. This is always a great idea as you eliminate the risk of accidentally damaging the other unmarked underground utilities. Alternatively, you can call the national 811 “Call Before You Dig” number. the reputable plumbers at smokymountaintreeservice.com take advantage of the state-of-the-art tools and equipment to check out if the sewer line is intact, and how far it is from the roots. We recommend getting an inspection early enough instead of waiting for the signs of sewer line failure. And, without a doubt, this move can save you thousands of dollars in the long run. When the roots have invaded the pipes, your plumber can use different root removal methods including— cutting up the roots or getting rid of the root structure using specially designed tools and chemicals. Some of the popular techniques used by professionals can temporarily stop the growth of the roots for a certain number of years, create a permanent barrier between the roots and pipes, or kill off the roots if needed. In extreme cases where the roots have damaged the sewer pipes, repairs are necessary. And repairing the pipes have been made a lot easier and can leave your landscape unharmed, thanks to the advancements in technology. If there’s the need to grow more trees and shrubs in your yard, they always make sure that the trees are planted at least 10 feet away from the sewer line. Speaking of the trees, you’ll want to go for sewer-safe trees like Cypress, Fringetree, Amur Maple, and Paperbark Maple. They are slow growing trees, with typically small root balls that may never make their way to sewers. On the contrary, you should avoid fast-growing trees, especially the Aspen, Sweetgum, Sycamore, Silver and Norway Maple. If you notice any signs of a sewer line blockage or break, or your trees are located near your sewer line, don’t hesitate to call Knoxville Plumbing Company for a professional plumbing solution. We’ll connect you to professional, certified, and experienced plumbers that deliver the first time they work on your project, and save you a substantial amount of money in sewer line damage repairs. If you would like to trim your property of trees call Smoky Mountain Tree Service for reliable Knoxville tree service.